I have about 300 notebooks. They're all over the place. I have to make lists to keep myself organized and on top of things, so I definitely need all 300 notebooks. Okay, so maybe I don't. This year, instead of collecting 300 more notebooks, I decided to try something new and go with an actual planner! I'm so excited about it and I couldn't wait for it to arrive in the mail. I researched a lot of different kinds, but there weren't any huge differences between the most popular ones I found. I decided to go with the Erin Condren, since it was recommended to me most. 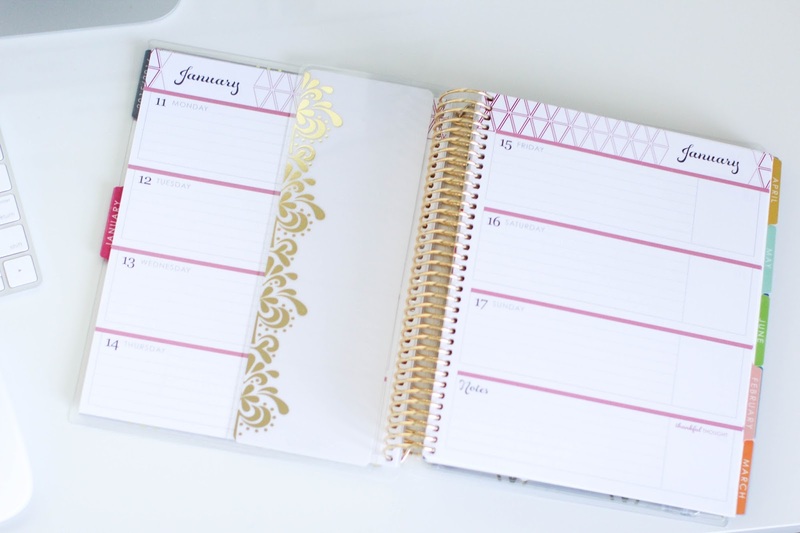 There are TONS of options for the cover of your planner. 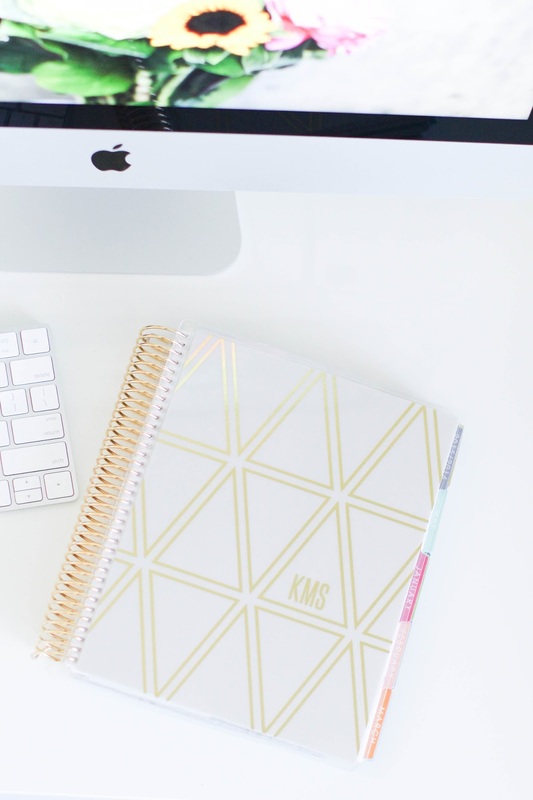 I chose this metallic gold and cream, personalized cover and I love it! Each monthly tab page starts with an inspirational/motivational quote. This is one of my favorites. Each month has a full monthly calendar tab, then it goes ahead and breaks down each week for you after. The tabs are great and make it super easy to find the date you're looking for. This is what the weekly layout looks like. I went with the horizontal weekly option, but there is also a vertical option that seems to be a little more popular. I thought the horizontal would be better for me, as I don't really need to plan my day down to the hour. If you're crazy busy and have tons of events and meetings each day to plan, the vertical may be a better option for you. In the back of the planner there is a page with a pocket on the front and back to hold papers or whatever you need it to, and there's also a small zipper pouch to hold pens/stickers/papers etc. I found the most adorable stickers from Karolinas Krafts on Etsy (obviously I got the glasses). 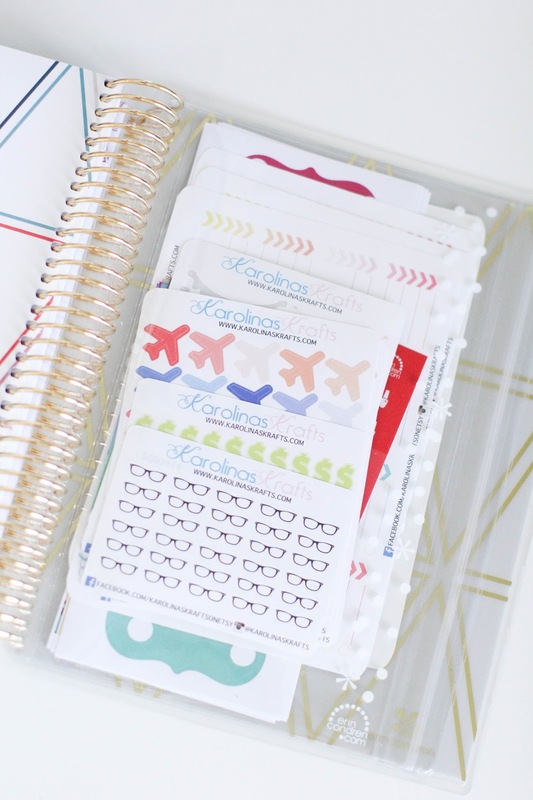 She has a million options, and even has an Erin Condren section where all of the stickers are made specifically for the EC planner and made to fit perfectly. I'm so excited for this new year and all of the adventures that lie ahead for me and my family! I've also linked a few other planners, notebooks and stickers that are great options as well. 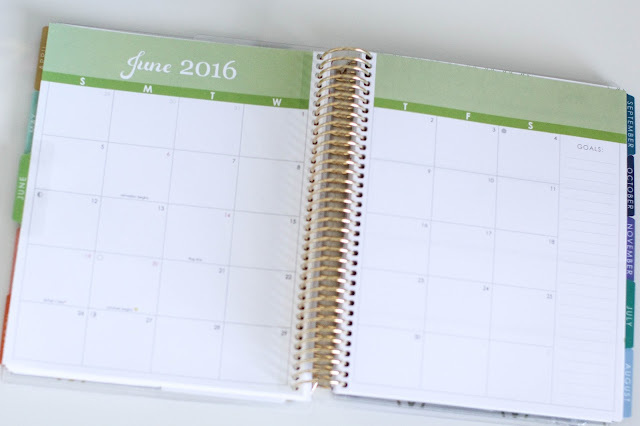 Have you used a planner? What kind? What did you love about it, and do you have any advice for me on how to best utilize mine? This is my 4th year using the Erin Condren life planner, and I'm convinced I would die without it! I use it for meal planning, appointments, work stuff... Everything. It's the best. Hope you love yours too! I'm LOVING mine so far!! So glad you love yours, too. I've heard so many great things! 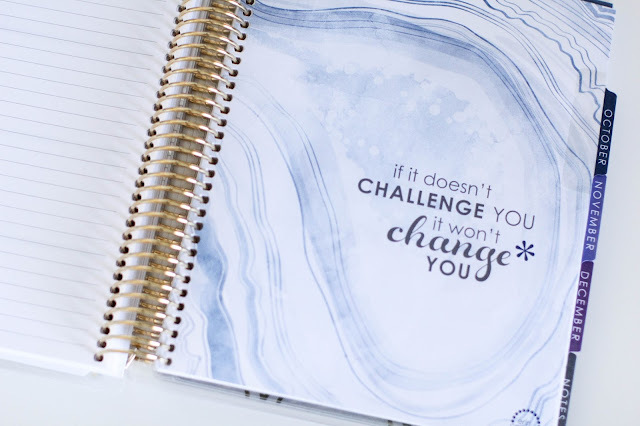 I ordered my first Erin Condren planner last week. I also ordered the horizontal.